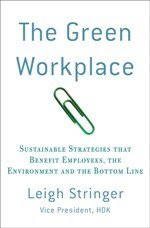 The Green Workplace: Disposable Water Bottles... Why Are They Still Here? Disposable Water Bottles... Why Are They Still Here? 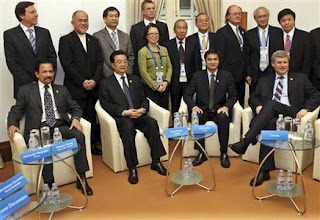 I just noticed this photograph of the Asian Pacific countries gathering in Singapore this weekend talking about their emissions pledges in advance of Copenhagen. Now, does anything seem strange to you about this photograph? Yeah, disposable water bottles? How can they possibly be serious about climate change issues posing in front of photographers with plastic bottles sitting prominently in front of them? As much as I'd like to give these guys a hard time, I struggle with the disposable bottle issue all the time. The real issue, I find, is having access to consistently clean, filtered water. I don't really have an issue at home or work, but when I'm traveling, I can drag around my reusable mug, but I really have no idea if the water fountains in the locations I'm traveling are trustworthy (if there are water fountains at all). I think it's time to start petitioning airports, hotels and restaurants to provide filtered water on a more regular basis. I'd even pay for filling my bottle up if I knew I could trust the source! I agree! Your comment about the photo is right on target. Then again what do you expect, these politicians probably leave all the recycling chores up to the maid. One thing I wonder is why in the USA only a few states have bottle return refunds, I think that if cans and bottles were returnable in every state, and fines were issued on water bottles when you buy them (antimony tax!) that would be a great step in the right direction. Your comments are indicative of the trouble with "green." While you are bouncing around airports wondering where you can get fresh clean water, most of the people in the countries represented by the politicians in the photo are wondering where they are going to get water every day, just to survive. Plastic water bottles are a god send to these countries because they provide the best low cost solution to keep these people from dying from water borne disease. You are narcisistic and short sighted. We in the US are lucky to be able to focus on such trite issues when the rest of the world is trying to get through the day alive. This is the disconnect of the "green" movement. We can change ourselves, but changing the rest of the world is a much larger task, and if we only change ourselves, it will not be enough. I am looking forward to have this course and will let you know if I can find a job working at home here in Canada. I wish I can because I am jobless for more than 3 years now. Finding a job here in Canada is hard especially if your diploma was earned outside Canada because the standard of education is different. I am hoping to get this study course soon and land a job.